We headed to Miami immediately following the U2 show in Tampa on December 1, 2001. We being me, Tasha, Jenny and Paola – the usual Elevation Tour crew I went to shows with back then. We arrived at the American Airlines Arena just before 5am on December 2, 2001, the morning of the final show on the Elevation Tour that had started 10 months prior also in Southern Florida. We got our numbers in the GA line (108, 109, 110 and 111) and then slept in our car, a small four-door rental, until about 9am. We checked into our disgusting hotel, showered, got our film developed from the Tampa show (remember when had to find a camera store to get our photographs developed? ), got lunch and then got back in line. A while later we went over to this Irish Pub in South Beach to pick up our ETS tickets, along with 12.2.01 Elevation Miami shirts and posters. We went back to the GA line for a bit, got our wristbands and then went over to wait for U2 to arrive. A limo drove in around 4:30 and supposedly it was Larry, but I couldn’t tell who it was. We waited until just about 6pm, but no one else ever drove in. We found out later U2 arrived around 7pm, but did not stop to greet the fans (probably because everyone was already inside). Once inside the arena, we ended up one person back from the front rail on the far right – Adam’s side. Usually I stood right at the rail to have something to lean on and hold onto, so this was going to be a new experience for the last Elevation show. Garbage again opened the show, but this performance would very different from the rest and so very exciting for me. Before their last song, Shirley Manson said their drummer was fired and he left. All of a sudden, I saw Sammy (Larry’s drum tech) dart out to the drum kit. Then Larry walked onto the stage in a navy blue shirt. I went nuts! Since I didn’t have the front rail to hold on to, I put my hand on poor Tasha’s shoulder to stabilize myself as I jumped like a pogo stick up and down screaming. I don’t think Tasha’s shoulder recovered for a day or so. I was SO exciting not only to see Larry, but to see Larry wearing something different than the rotation of the light blue, maroon and grey shirts I had seen on the past 26 shows I had been tour on this tour. Larry played the drums along with Garbage to “Only Happy When it Rains,” which will always be my favorite Garbage song. Larry played differently with Garbage. He seemed happier and much more into and excited, probably because it was a different song that he hasn’t played thousands of times. This Miami show, the last on the Elevation Tour, was amazing and very emotional! It was the first time I heard “In God’s Country” (from my favorite The Joshua Tree) played live in concert. Bono played the harmonica at the end of it, which just added to magnificence of it. 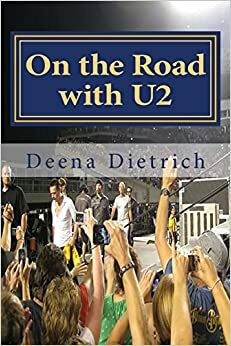 For the first time on that leg of the tour, I heard “Mysterious Ways.” U2 again played “Wild Horses” and “My Sweet Lord” like they did the night before in Tampa. Our friend Matt was pulled up on stage to play “Knockin on Heaven’s Door” with the band, and our friend Dan was pulled up again during “Stuck in a Moment.” And Tasha finally had her concert moment with Adam when he reached down, squeezed her hand and gave her his guitar pick after “Pride.” I had been crying for three songs by this point. I started crying during “Streets,” all through my favorite “I Still Haven’t Found What I’m Looking For” and into “Pride.” It just hit me that this was the last show. Over the past 10 months, I had seen 27 Elevation shows including the first and the last of the tour, plus all the friends I had made and places I had seen. It was a magical tour and a magical night in Miami. After the show, we hung out with everyone outside the arena and just watched the trucks drive away. Elevation Miami 12.2.01 Set List for the final show: Elevation, Beautiful Day, Until the End of the World, Mysterious Ways, Out of Control, Sunday Bloody Sunday, Stuck in a Moment, Kite, In God’s Country, Knockin’ on Heaven’s Door, Please (acoustic), Bad / Who’s Gonna Ride Your Wild Horses, Where the Streets Have No Name, I Still Haven’t Found What I’m Looking For, Pride, Bullet the Blue Sky, What’s Going On?, New York, One, My Sweet Lord, Walk On / 40.